I don’t know, Laurence, he doesn’t look very threatened by you. Oh uh. F-bomb. The war between scarf and necktie escalates. Oh? this is going to be interesting. Is Alice’s mother related to Laurence? or is that to spoilerish to answer? Also great comic, I find solace once a week in reading it. 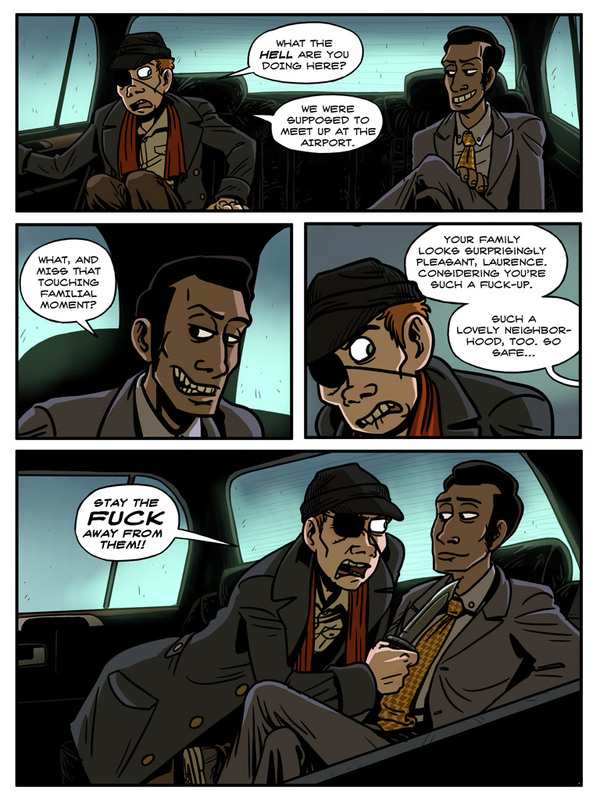 Oh god, panel three, Laurence’s face….That is one funny expression. Maybe it’s both. Maybe he had some taco bell for lunch. Does Taco bell even exist then? In the (alternate) future, all restaurants are Taco Bell. Suddenly I have newfound respect for Lawrence. I’d be threatened by any man that could hide a knife that big! hey, you can kinda see it in the previous pages a little bit. There’s a lump on his back, that’s the knife. Not the only weapon on him, actually. He should probably put those away before he gets to the airport, though. But that is called cannibalism ,my dear children, and is in fact frowned upon in most societies. P.S I’m stalking you now. Muahahaha! Every one gets tea and cookies! Plus gps tracking equipment! re: your Twitter. Confession: I have a folder dedicated to hilarious gifs. Also one dedicated to LJ icons, some of which are animated. OH MAN your G-Man is so…rhgghg!! So smooth and evil and the dentition my WORD totally makes him evil. OK, you know what? In Harry Potter, you can tell a good guy from a bad guy just by their names. Well, in your universe? BY DENTITION. It’s obviously really important that I keep every icon I’ve ever had. Might need those again sometime! Dentition isn’t that they’re toothy…it’s that their toothiness is specific to the individual. (I first heard the term in relation to the making of THE INCREDIBLES…they also have very specific, individual teeth-shapes). They don’t all have the same generic teeth-shapes and I love that. Never stop. It makes your work individual, I think. See this guy with the tie? Yeah…he has toally douche printed alllllllllllllllllllllllll over him. I had a feeling I liked Larry. Now that I know he carries a combat knife, all the more. I’m realizing that being armed with a blade makes him that much more like a pirate, I guess. Hahaha. Schtein could learn a thing or two about concealing weapons from this guy. We ah, don’t know who this guy is yet, right? He looks vaguely like that teleporting smoke man. See, the thing about acting non-threatened by the low-level henchman when you’re the boss: Don’t act TOO smarmy, or you may find that blade pressed about an inch deeper. I don’t know how you make every single page so entertaining, but please don’t let it stop. I remember you saying at one point Doc sounded like Willem Dafoe with a Southern accent in your head, but what does Laurence sound like? A very slight southern accent. I don’t know, let me flesh him out a bit more in the comic. And I always gave him this classic Dr. Frankenstein accent, except more subtle. And then after that Halloween picture he sounded a tad bit like Riff Raff. BLACK SMOKEY MAN HAS EVOLVED … CHEEKBONES! I thought I didn’t like Laurence, but he’s really growing on me. It might be the eyepatch. he’s only been in three scenes, hahah. Hard to feel one way or the other about a character ya hardly know.